Pam Flowers had a dream, but unlike many people, she had the courage to pursue it. Alone Across the Arctic tells of a gripping adventure of her solo trip across the North American arctic coast by dogsled at the age of 46. Retracing in reverse a 1924 expedition led by Norwegian explorer Knud Rasmussen, Flowers and her eight sled dogs mushed the 2,500 miles from Barrow, Alaska, to Repulse Bay in Northwest Canada, becoming the first woman and the first American to do so. Children’s author, Ann Dixon, tells her story. Exposed to life-threatening perils–melting pack ice to intense blizzards to a frightening encounter with a mother polar bear. Flowers sets out to do what no woman has ever done–traverse the top of North America alone. Fulfilling a lifelong dream and driven by an adventurous spirit forged in childhood, she left her job as a respiratory therapist and began seriously training for the expedition in 1992. She began her trip in February 1993. However, this book implies that this journey would be even harder for a woman than a man. In fact, Flower’s expedition would have been hard for anyone. The arctic is an unforgiving environment. Even after extremely detailed planning and training over several years, Flowers almost lost her life when the temperature warmed too early, almost stranding her in the middle of Queen Maud Bay. Flowers’ book follows a unique format–half original diary entries made by Flowers as she made her way across the frozen landscape and half as-told-to writer Ann Dixon upon her return. The result is a complete picture of what it was like for the months it took for Flowers to make the journey. She immerses her readers in her journey, giving them insights into the incredible tenacity required to complete such a trip. And when tenacity and hope finally ran out, depending on the generosity of strangers. What this book also brings out is the love and respect a musher has for his or her dogs. Ranging in age from one to nine years, they spring to life through Dixon’s descriptions of their strengths and distinct personalities. Not only did the dogs have to work as a team, but Flowers depended on them to survive the rigors of such a trip. She tells how her lead dog, Douggie, was able to sense the right direction even when she couldn’t as together they battled cold, wind, storms and exhaustion on the tundra. Brief visits with settlers in the small Alaskan and Canadian villages where they rested and Flowers picked up supplies broke their isolation. At a point almost near the end, she and her dogs almost succumbed to starvation and hypothermia after almost falling through melting sea ice. Flowers was particularly proud that "all eight dogs that started the journey finished in excellent health and good spirits." Photographs, taken by Flowers along the way, accompany Dixon’s and her text and help to make her book more interesting, especially for readers who know little about dogsledding. Short sidebars explain details like what kind of clothing she had to wear, what a typical day is like for a dog musher, and such practical topics as blizzard camping and tent defrosting. 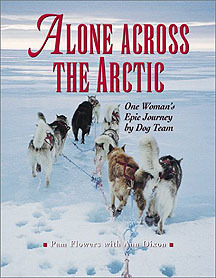 Pam Flowers and her dogs completed both the Iditarod Trail Sled Dog Race and two trips to the Magnetic North Pole. She was also awarded the Gold Medal from the Society of Woman Geographers in 1996 and Outside Magazine named her an "Outsider of the Year" in 1991. Ann Dixon is a full-time writer and author of five books. For those interested in dogsledding and those with the dream to challenge the Arctic, this book is essential.